Did you know you can transform your rooftop into an oasis of energy savings and create a triple win for your restaurant? They serve as a colorful, exciting venue for special events too. A green roof means that your building’s roof is partially or completely covered by plants. 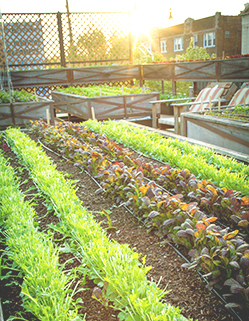 You could have a rooftop garden with herbs and vegetables to supply your restaurant or simply a grass-covered area if you don’t want to manage a garden. Why should you bother with a green roof? Because green roofs absorb sunlight and insulate your restaurant, keeping the interior of your restaurant cooler in summer and warmer in the winter, thereby saving you money on air conditioning and heating bills throughout the year. Green roofs help to decrease noise pollution and can increase sound insulation by 50 percent. Green roofs can prolong the life of your roof and reduce roof maintenance issues. They help reduce storm-water runoff too when rain is trapped in the soil and used by the plants. While the initial cost of building a green roof can be expensive, the long-term savings can offsets those costs. In addition to reducing your energy costs, you can increase traffic at your restaurant! Customers, particularly millennials, as well as the media, are always interested in finding memorable and noteworthy rooftop gardens to dine at or report on (creates buzz).